Considered as one of the first of its genre, Dear Esther started a new wave of first person adventure games. The original PC release of Dear Esther came out some time ago, but now it is out on PlayStation 4. The Landmark Edition release of the game features a new Director’s Commentary in addition to the main game, but that’s about all that’s new. With this style of game, there isn’t much in terms of gameplay, besides walking and looking around. That’s not a bad thing though, as the appeal to the game is exploring its story, mixed with the visuals and excellent musical score. Dear Esther was the first game released by developer The Chinese Room, who other PlayStation gamers may know from 2015’s Everybody’s Gone to the Rapture, another first person adventure. As Everybody’s Gone to the Rapture was more about exploring a town with a little freedom for the player to explore, Dear Esther is a much more linear adventure. You begin as an unknown individual who is exploring a mysterious island, listening to a narrator who is telling stories of the past. As you explore and progress down the linear path, you’ll learn more and more about what happened. One of the most appealing parts of the experience is its atmosphere. The mixture of storytelling, visuals and the musical score evoke an eeriness to the island. The island is desolate, and remnants of individuals that used to live there add to its mystery. Abandoned homes, shipwrecked boats and cryptic symbols deepened my engagement of its atmosphere. Seeing one of the remnants of the past made me want to explore it and try to piece together what happened. You aren’t directly given context to what happened in every little moment, but I like to think some of it was left up to your imagination. What you see visually and what the narrator portrays is about all of the story you’ll get in Dear Esther. There aren’t any notes to read or items to pick up, but there are four mysterious urns that act as a minor collectible for the game. For my first playthrough I completed Dear Esther: Landmark Edition in about an hour and a half. Going back for the Director’s Commentary will take about the same amount of time, which I highly recommend. The Director’s Commentary was recorded fairly recently, as the developers mention games such as Firewatch and Gone Home. The developers talk about how the game started as a Half-Life 2 mod and how it progressed over the years. They also mention other games such as System Shock 2 and Dead Space and how they were inspirations for their first game. Another voice on the Director’s Commentary was the composer, and hearing her reasons for certain sound cues or times the musical score would kick in is insightful. Another aspect of the commentary is how the new wave of first person adventures is portrayed in today’s gaming world, and how they feel these games are currently represented. 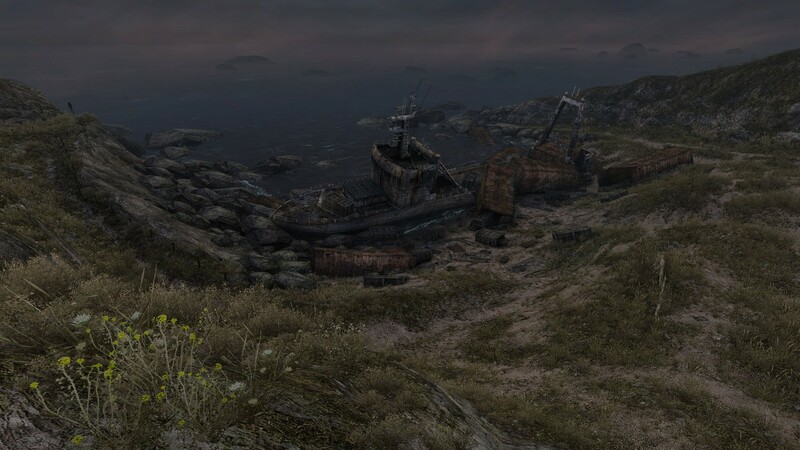 The visuals for Dear Esther have held up for the most part over the years. Objects and textures look good, though some are muddled if you get too close. Gazing at the game’s large landscapes from a hilltop is where the game really shines, as the sense of scale and the sound of the wind blowing by really immerses you in its world. Dear Esther isn’t a groundbreaking experience, but it did help pioneer more games in its genre. It will take you a little under 2 hours to complete the game’s four main areas, but it is a game that you might want to play again upon completing it to further understand its plot. The Director’s Commentary will add another playthrough for those looking for an interesting background on how the game was created and its inspirations.